Edition of 3502 of which 150 copies are signed 1-150; 26 are signed A-Z as artist's proofs; three sets are signed as progressives; five are signed as dedication copies. July 31, 1990 11 colors 17-5/16" x 24"
Quail and quince. An alliterative pair, camouflaged in warm Autumn colors. The quince can't make up its mind whether it wants to be eaten or not. Austere and astringent, the fruit when raw is quite inedible, though it exudes an irresistible fragrance. Cooked up in quantities of sugar, however, it forms a pleasing preserve, but much of its perfume is lost in the process. Capturing the wily quince is not difficult; all that is called for is time and patience. Plant a quince near a wall where it will get plenty of sun and wait. In time, and with the admixture of culinary art, you will have something tasty to put on your morning toast. The quail, on the other hand, is not at all of two minds: it does not want to be eaten, cooked or otherwise. It is this creature's misfortune, however, to be highly agreeable to the palate, especially when broiled with a little olive oil. 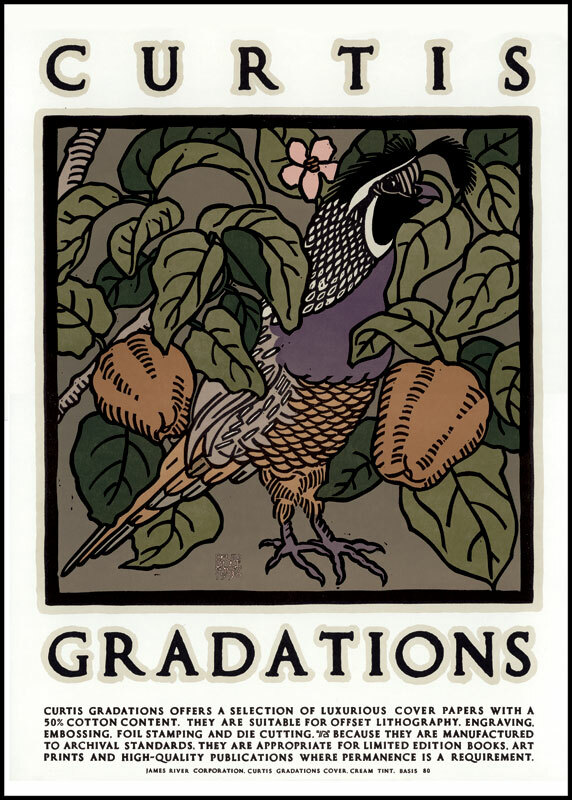 Nature has provided the quail with protective coloration so that it may escape notice; and also with wings, so that it may elude its pursuers-though it often prefers to run along the ground, seeking cover in dense foliage. None of this does it much good. There is no useful moral in these observations: if you taste good, you will be eaten. If you don't taste good, ways can be devised to make you edible, and you will be eaten anyway. Nobody gets out of here alive.